BUFFALO, N.Y. -- Middle and high school musicians and thespians have the chance to study with Buffalo State faculty members and other performing artists during Buffalo State’s 2018 Summer Performing Arts Institute. Previously called the Summer Music Institute, the current institute includes a new Musical Theater Camp in addition to two continuing music camps designed for Western New York students entering grades seven through 12. 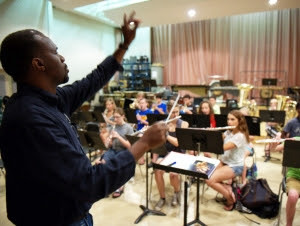 The Classical Camp (July 30-August 3) provides participants with the opportunity to play in large ensembles and chamber groups, work on music theory, and try piano, guitar, and African drumming. In the Jazz Camp (August 6-10), students play in a big band and small combos, study jazz theory, do improvisations, and participate in a jazz composition exercise. Both camps are designed for musicians who are proficient on their primary instrument. The Musical Theater Camp (August 6-10) immerses participants in vocal, dance, and acting exercises and instruction. Jennifer Toohey, assistant professor of theater, is leading the camp with help from Buffalo State dance students. Not only does the summer institute provide area teenagers with an enriching summer experience, it also serves as a recruiting tool for the college. Fleming said that several students who attended the music institute later enrolled in Buffalo State’s music program. Each camp runs from 8:00 a.m. to 3:00 p.m. Monday through Friday in Rockwell Hall and costs $200. Scholarships are available based upon financial need. All three camps culminate with a public performance on the Friday evening at the end of each camp in the Performing Arts Center and the Louis P. Ciminelli Recital Hall at Rockwell Hall. For more information, contact Fleming at (716) 878-6504. To register, go to the Summer Arts Institute website.